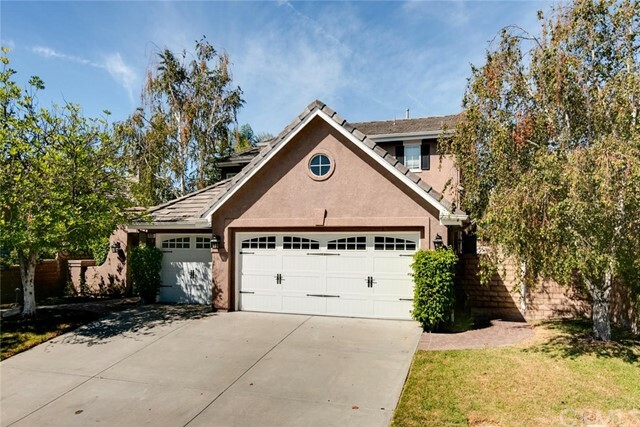 All Thousand Oaks homes currently listed for sale in Thousand Oaks as of 04/25/2019 are shown below. You can change the search criteria at any time by pressing the 'Change Search' button below. 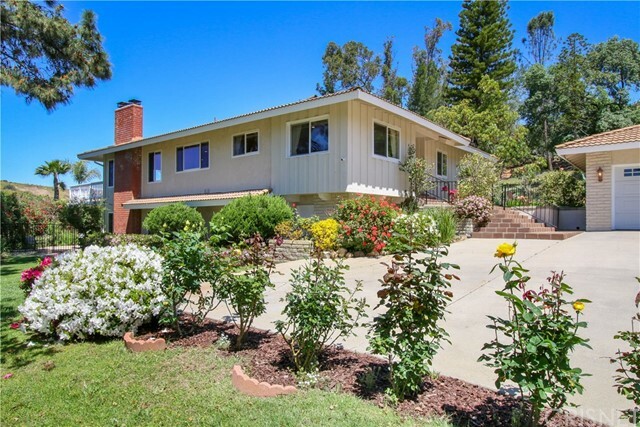 If you have any questions or you would like more information about any Thousand Oaks homes for sale or other Thousand Oaks real estate, please contact us and one of our knowledgeable Thousand Oaks REALTORS® would be pleased to assist you. "Redesigned and renovated by designer Roy Sklarin, this luxurious French Formal estate is beautifully situated on over 20 spectacular acres of land. The palatial residence features 14,000 square feet of lavish living space, 7 bedrooms, 13 bathrooms, comprised of a deluxe master bedroom suite with dual baths, walk-in closets, a gourmet double-island kitchen and pantry, a wine connoisseur's tasting room, a theater, a gym, a separate guest quarters. The property is being offered furnished with its c"
"Sunrise Ranch is one of the most spectacular horse facilities in the country. Originally one of three properties that were assembled to form the famous Sandstone Ranch, it is only one of thirty-seven ranches in Hidden Valley. Sunrise Ranch has been designated an Olympic training facility, and has hosted elite class athletes from all over the world. The footing for both the Olympic size dressage ring and the 150 x 300 foot jumping arena is European felt mixed with silica sand accompanied by sprin"
"Twin Acres Ranch is one of the most magnificent parcels of land in the prestigious Hidden Valley. Surrounded by soaring views of the Santa Monica Mountains, Hidden Valley became popular with the motion picture industry in the 1920's, and was once home to Roy Rogers, Dean Martin, and Sophia Loren, among other legendary Hollywood pedigree. Today, the area compromised of only 37 ranches, continues to be an ideal escape for celebrities and high net worth individuals seeking privacy and tranquility. " 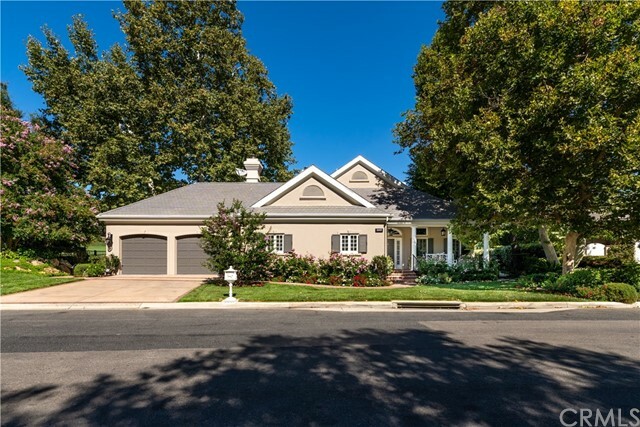 "Welcome home to this single story home located in the Reflections section on the 14th hole behind the gates in the prestigious Sherwood Country Club Estates. Equipped with top of the line appliances (Miele & Viking), this elegant home boasts a huge master suite with large walk in closet and master bathroom. See-thru fireplace overlooking the relaxing master spa bathtub and master bedroom. 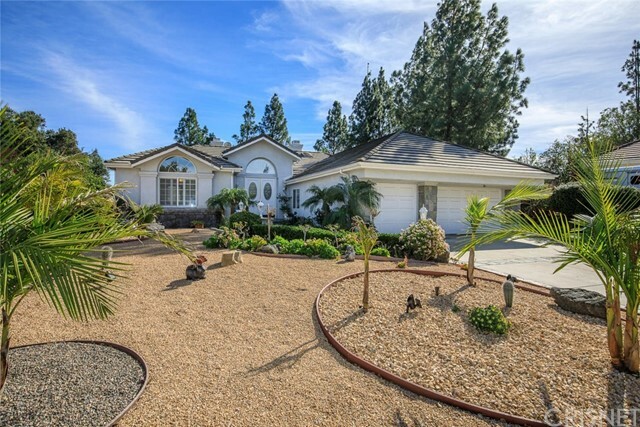 Easy access powder room centrally located off the kitchen, separate room for an office, gym, library, waitin"
"Horse property set in a secluded enclave in Lynn Ranch, Thousand Oaks, with miles of horse trails, your private estate awaits! This beautiful, 4BR;2.5BA family home with over 3,000 SF of living space offers soaring ceilings, separate entrances, bright & sunny rooms & every surface has been renovated. 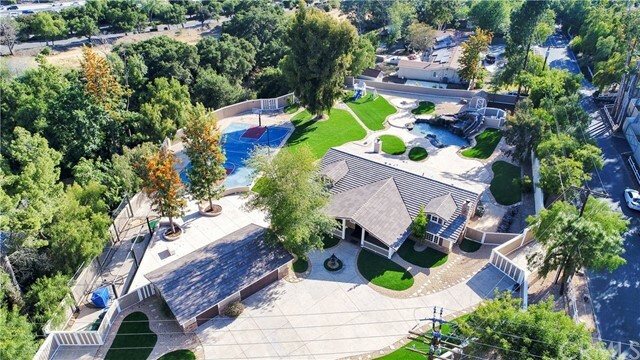 The 1.16-acre lot offers your kids a complete sports camp in your own private backyard including pebble pool, waterfall,waterslide,lighted batting cage, lighted full BB court, putting green, RV park"
"Welcome to this gorgeous, custom built Mission style home located in one of the most desirable neighborhoods of Thousand Oaks. This true beauty MUST be seen in person to appreciate all the details that went into this renovation. This home was rebuilt from the studs up with over $1.3 million in upgrades. This flawless estate features American clay walls and ceilings all throughout, interior and exterior LED lighting, solid wood and tile flooring, solid wood doors throughout, custom designed firep"
"Beautiful single story home perfectly situated at the end of a cul de sac and set back from the street. Built in 1995, the home features impressive curb appeal, an open floorplan with great flow and lots of natural light. Wood flooring, high ceilings, recessed lighting, spacious island kitchen opens to the family room. Inviting living room with fireplace, large master suite with fireplace, steam shower and walk in closet. Jack and Jill bath, formal dining room, indoor laundry room, attached gara"
"Welcome to the utmost in Luxury in Lang Ranch. This extraordinarily two-story residence has been extensively remodeled with the finest most luxurious upgrades, amenities and expertise. You will be beyond impressed as you walk through the ample entrance with all of the custom amenities. First floor: Double door entry to the entertainers living room which features fireplace, Built-In-Wet Bar w/wine fridge and sink, Dining area with a gorgeous chandelier. Mother-in-law quarters with full bathroom a"
"Luxury living awaits behind the gates of this serene single story Lynnmere home, located on a cul-de-sac & corner lot. 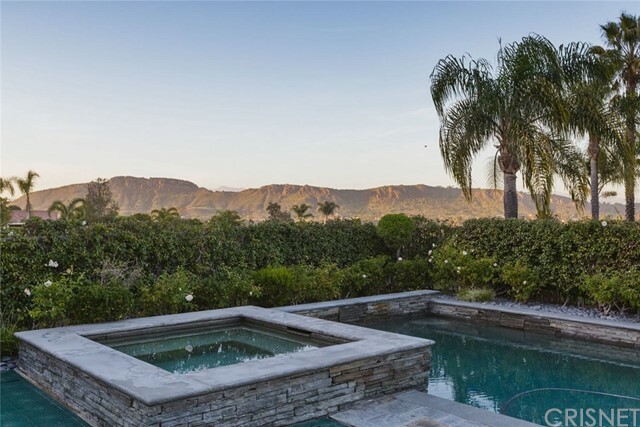 Backing to open space and offering breathtaking 180 degree views of Mount Clef and surrounding hillsides from your oasis backyard, this entertainer's paradise covers it all! Stunning stamped concrete pathways, landscape abounding with roses and birch trees greet your arrival. Enter refined living with vaulted ceilings and a spacious open floor plan with white oak hardwood floors"
"Beautiful hill-top estate on a 47,054 SQFT corner lot with impressive and usable grounds- able to add a spacious guest house/mother-in-law suite. Also an outdoor entertainers delight! This 4 bedroom home has a sprawling updated kitchen, complete with granite counter tops and center island, custom cabinets, stainless steel appliances, travertine floors, and a large desk/study nook. The spacious family room boasts a fireplace and Brazilian walnut floors. 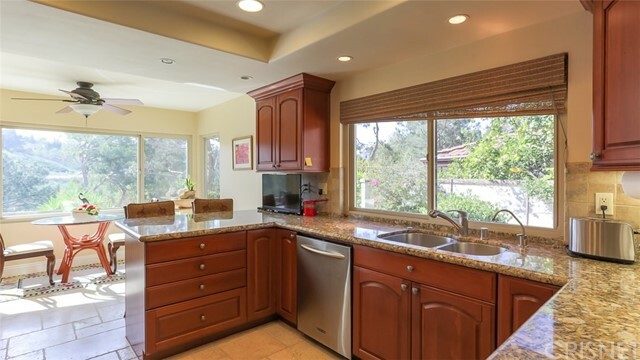 Two over-sized guest bedrooms upstairs disp"
"Attention All Thousand Oaks Westlake Village Buyers & Agents! Wait Till You See This Gorgeous Upgraded Single Story Tuscan Style Super Sharp Showplace! Perfect Mint Move-In Condition! 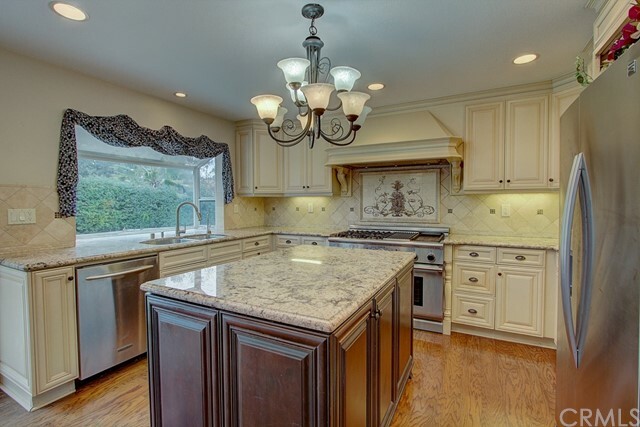 Beautiful Imported Italian Tile Flooring Throughout! Architectural Arches & Details! Award-Winning Open Floor Plan! Gorgeous Granite Center Island Chef's Kitchen With Designer Backsplash, Stainless Steel Appliances, Breakfast Bar, Lots Of Storage & Eat-In Area! Lovely Living Room & Fabulous Family Room Each With Th"
"WOW! HUGE PRICE REDUCTION! 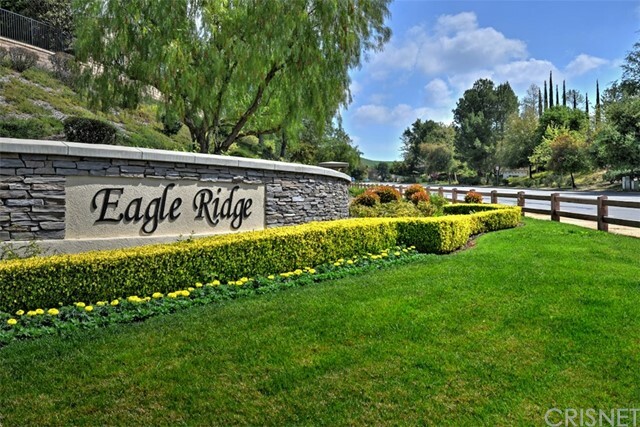 World famous exclusive 24 hour guard gated community of prestigious Sherwood Country Club. This premier townhouse has exquisite appointments, explosive views of the majestic Santa Monica mountains, and lake views. This beautifully decorated home includes an open floor plan with gorgeous slate tile and marble floors, custom carpet and granite counter tops; gourmet kitchen opens to the family room with fireplace and outdoor balcony/patio. Formal living room with fireplac"
"Prepare to be wowed by this impeccably cared for and updated 4 bedroom, 3 bath Lynn Ranch home. Enjoy scenic mountain views from nearly every one of the dual paned windows and glorious sunsets from the spacious western exposure deck. The functional layout includes first floor eat-in kitchen with granite counters and easy-on-the-feet cork flooring, dining and living rooms, master suite with large walk-in closet and 2 secondary bedrooms with dedicated full bath. Perfect for entertaining, the over-"
"Available Now! All remodeled spectacular 2 story Cape Code style home with 4 bedrooms & 3,5 bathrooms, all upgraded & or remodeled featuring many details including double custom iron door entrance, all newer solid interior doors, crown molding & baseboards throughout, custom iron railing stairways, porcelain & oak hardwood floors, all newer bathrooms, modern upgraded kitchen, custom wooden cabinets, Brazilian granite counter tops, glass mosaic backsplash, stainless steel appliances, huge master "
"Wow! 31975 sf lot size. 5 Bedroom 4 Bath home completely refurbished and ready for a new owner. Large Master suite with its own bathroom. 2 Large RV accesses. Where else can you find all this including being on a quiet cul de sac. Better hurry on this one!." 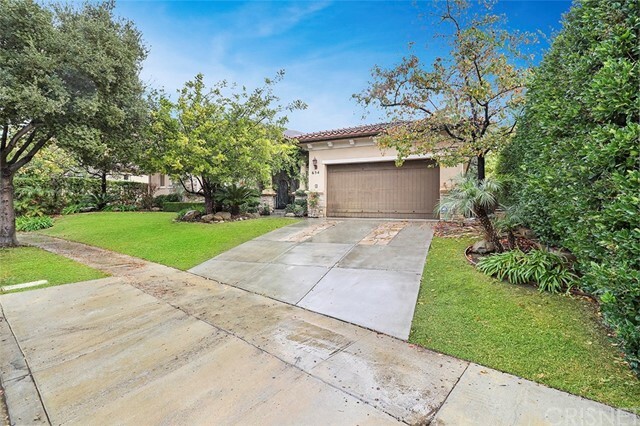 "Welcome Home is how you will feel when you walk into this beautifully updated single story ranch property in Prestigious Waverly Heights in Thousand Oaks! This home offer 4 bedrooms, 3 bathrooms (could be 2 master suites) and approx. 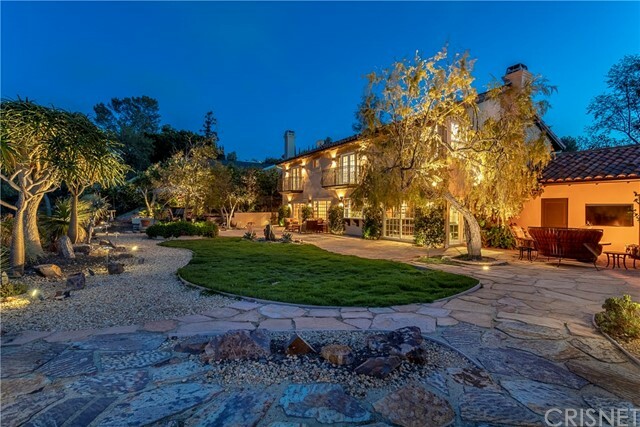 2200 square feet of stylish living space on a Huge 20,700 square foot lot zoned for horses! 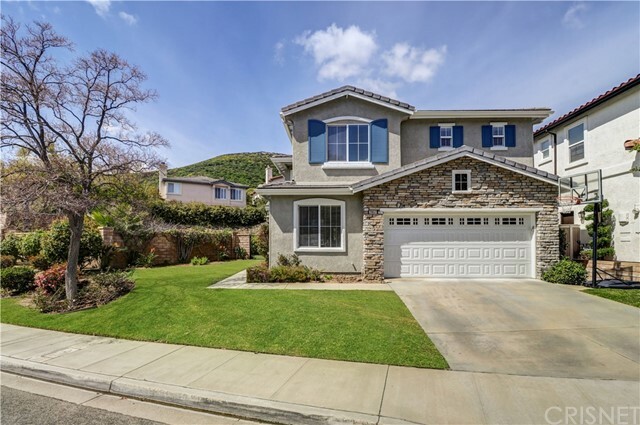 Featuring gleaming wood flooring, travertine tiles, dual pane windows, smooth ceilings, recessed lighting, beamed ceilings and a cozy fireplace in"
"This home is located behind the gates of Eagle Ridge nestled in the hills of Lang Ranch. Enter through the double doors and find an upgraded and modern inviting space with oversizes windows to fill the home with natural bright light. The kitchen has been exquisitely remodeled top to bottom with high end cabinetry, quartzite countertops, and and oversized eat in island. A spacious downstairs layout is perfect or entertaining with a large living room and dining room, and a great room with fireplac"
"Back on Market ~ Bring your Buyers!! Fall in Love with this Pristine Home, tucked away on a quiet cul-de-sac in the sought after Sunset Ridge Community. The Open Concept Chef s Kitchen overlooks the formal Dining Area and features a 5-Burner Gas Stove and Double Oven. Retreat to your Spacious Master Suite, that is filled with plenty of natural light and accented with a luxurious oversized Soaking Tub. French Doors lead into the Den that is located Downstairs, which could also be u"
"Attention All Thousand Oaks Bellagio Buyers & Agents! Wait Till You See This Super Sharp Showplace Home On One Of The Largest Lots In The Entire Highly Desired Gated Bellagio Community With Sparkling Pool, Inviting Spa & Playground! 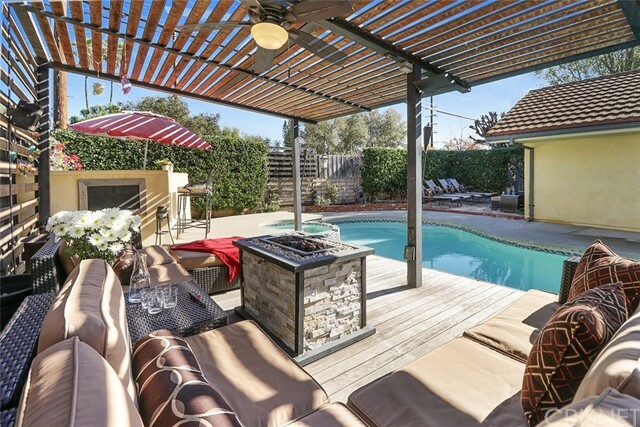 Huge Entertainer s Dream Backyard With Room For A Spectacular Pool & Everything! Award Winning Schools Nearby! Lang Elementary! Los Cerritos Middle School & Westlake High School! Excellent Floor Plan With Bedroom & Bath Downstairs! Light & Bright! Spac"
"This immaculately maintained Thousand Oaks cul-de-sac home is 3,260 sq ft, has 4 bedrooms plus a downstairs permitted bonus room (currently built out as a professional music studio), and 4 bathrooms. 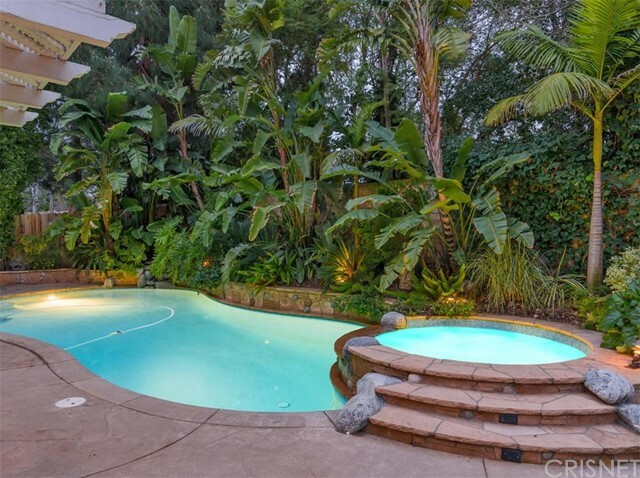 Built in 1990, this home has an entertainer's backyard showcasing a professionally designed tropical oasis with built-in gas BBQ, gas firepit, salt water pool, spa, & waterfall. Owned solar and gas heating are available for the pool. 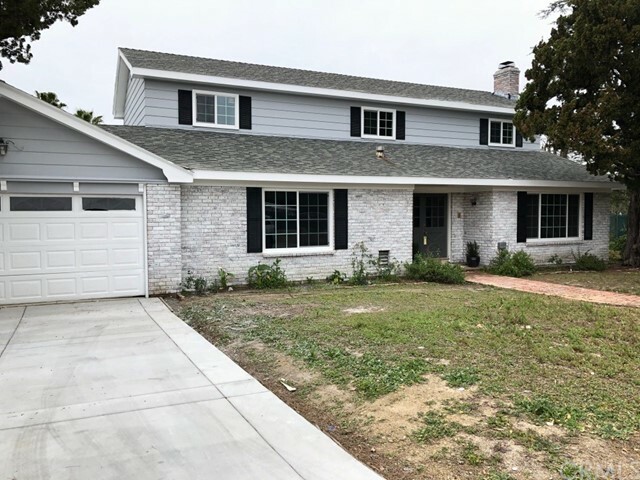 The recently upgraded kitchen has new granite counters and opens t"
"As of this $20,000.00 price improvement, there are 12 homes in escrow within a mile of this fantastic property; the Sellers want 3280 Casino Dr. to be in escrow next. Chanteclair Estates is located in walking distance to Sunset Hills Park (across the street), Lang Ranch Elementary School, Gilson s, Starbucks and more. The home rests on a level 9,600sf private lot, room to add a pool and keep a large back yard along with generous side yards. The interior is open with vault"
"Beautiful West Hills home with golf course views overlooking the Sunset Hills Country Club. Updated throughout and ready for your family. Highlights include an open floor plan with a beautiful large kitchen featuring Bosch and Thermadore appliances, granite counters, cherry wood cabinets a breakfast area and outdoor patio access. Adjacent to the kitchen is a large family/game room with wet bar and gaming area. The living room features a fireplace and direct access to the back yard entertaining a"
"Price Reduction! An entertainer's dream!! This 4 bedroom, 3 bathroom pool home sits on a beautiful 9090 sq ft lot. Cozy up by the fireplace in the formal living room. Walk past the large dining room into the eat-in kitchen with upgraded cabinets and granite counter-tops. Off the kitchen is a large family room with fireplace. Beyond the laundry room you ll find a private guest bedroom and bathroom which overlooks a large grassy bonus space in the backyard. Located on the other side"
"Beautiful single story 4+2 with views of the Sunset Hills golf course and hillsides. Upgraded/remodeled kitchen with dark cabinets, granite, SS. Travertine flooring, plantation shutters, newer windows, large Pantry and lots of storage. Sited in the much sought after East Hill neighborhood. This community features a park, walking trails and green belts."